The probe was set to grab more pictures and other science data on the object, as it passed 12,500km from the surface. Controllers got a last health status report, before the robotic craft turned its antenna away from the Earth to concentrate on its target. Only when New Horizons has its trove of images safely in its onboard memory will it call home again. This is not expected to happen until just after midnight (GMT) into Wednesday. It means there will be a long, anxious wait for everyone connected with the mission, as they hold out for a signal that will be coming from almost five billion km away. But scientists already have colour data from the approach and said they might release a new picture later on Tuesday. Images set to be released on Wednesday could be more than 10 times the resolution of those already published. “We have completed the initial reconnaissance of the Solar System, an endeavour started under President Kennedy more than 50 years ago and continuing to today under President Obama,” said the mission’s chief scientist Alan Stern. It marks the fact that every body in that system – from Mercury through to Pluto – will have been visited at least once by a space probe. “This is true exploration…that view is just the first of many rewards the team will get. 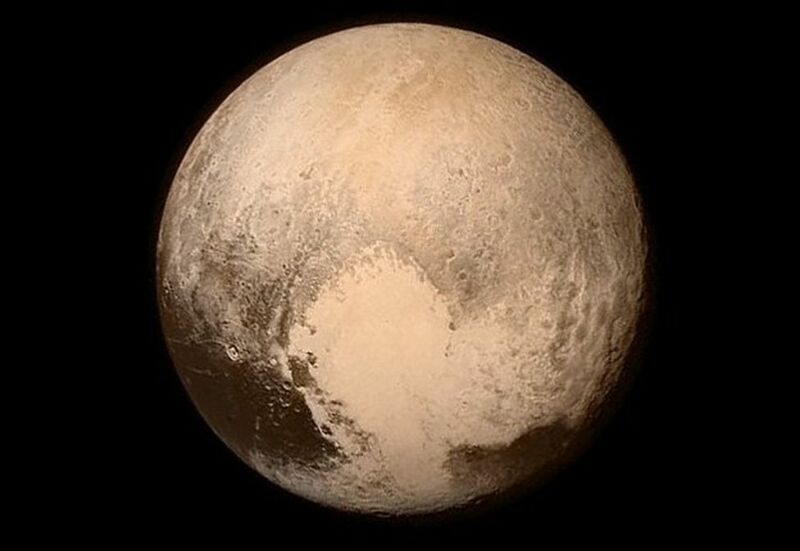 Pluto is an extraordinarily complex and interesting world,” said John Grunsfeld, Nasa’s science chief. This was timed to occur at 11:50 GMT (12:50 BST). But scientists were already attempting to interpret data and images sent back during the approach. The probe will investigate not only Pluto but also its five moons: Charon, Styx, Nix, Kerberos and Hydra. New Horizons was to have made its closest approach to Charon at 13:04 – at a distance of 28,858km from the surface. To achieve that, it had to perform a furious set of manoeuvres as it pointed every which way in the sky to get the images and other types of data it needs. Most moving for me has been catching a few words with the son of the man who first found Pluto. Al Tombaugh is obviously delighted that a sample of his father Clyde’s ashes is on board New Horizons speeding past Pluto and now heading into the unexplored realm of the Kuiper Belt. Just getting the probe in position to make the flyby has been a monumental feat. Because the observations are all run on an automated command sequence, New Horizons had to fly a perfect path past Pluto, and with perfect timing – otherwise its cameras would have shot empty sky where the dwarf or its moons were expected to be. This necessitated aiming New Horizons at a “keyhole” in space just 100km by 150km (60miles by 90 miles), and arriving at that location within a set margin of 100 seconds. All this was achieved after a multi-billion-km flight across the Solar System lasting nine and a half years. The mission team will not celebrate until New Horizons contacts Earth again, which should happen at 00:53 GMT Wednesday (01:53 BST). This communication will contain only engineering information on the status of the probe, but controllers should be able to tell very quickly whether the flyby sequence worked properly or not. Any stray icy debris would have been be lethal if it had collided with the spacecraft at its 14km/s velocity (31,000mph). As an insurance policy, the mission team therefore downlinked one last set of data from all seven of the probe’s instruments on Monday. On Monday, the New Horizons team announced a new, more precise measurement of Pluto’s diameter at 2,370km. The probe sees the girth of Charon to be very similar to earlier estimates, at 1,208km. Nix is estimated to be about 35km across, and Hydra about 45km in diameter. Kerberos and Hydra are a lot smaller, but New Horizons has not yet been able to make a good determination of their size. This will come from the flyby data.